Sell ratings from stock analysts are rare. So is pessimism from the International Monetary Fund, which on Monday reduced its outlook for global growth next year by only a fraction – and for this year not at all. As the IMF points out in its latest publication, stresses in the euro area have “ratcheted up” and growth in large emerging economies has been disappointing since its last forecast in April. The deepening gloom has led investors to seek safety, pushing down by about a third since then the already low yields on 10-year U.S. and German government bonds. And Chinese equities have lost around 8 percent, at least partly reflecting the fear of a serious slowdown in the Middle Kingdom. Yet the IMF left its forecast for global expansion at 3.5 percent for this year and nudged its estimate for growth in 2013 down by just 0.2 percentage point to 3.9 percent. If that turns out to be too sanguine, it won’t be the first time. In September 2010, the IMF projected a 2.6 percent contraction in the Greek economy the following year and a recovery to 1.1 percent growth in 2012. In fact output shrank 6.8 percent in 2011 and is on track for another 6.9 percent contraction this year, according to the Foundation for Economic and Industrial Research, a Greek think tank. That has undermined the rationale behind the 30 billion euro loan the IMF dispensed to Greece, now its biggest debtor. Of course, he was not alone in being sanguine at the time. But as with Wall Street and its stock price recommendations, the IMF’s business might be tougher if its forecasts are too bleak. The fund has to make the case its crisis loans will be repaid. Even with no such intention, that’s a subconscious reason to avoid facing up to the worst. All economic forecasts should be taken with a pinch of salt. The IMF’s require an entire shaker. 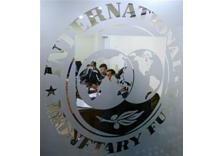 The International Monetary Fund on July 16 lowered its forecast for global economic growth in 2013. In an update to its World Economic Outlook the Washington lender scaled back its forecast for growth next year by 0.2 percentage point to 3.9 percent. It said it expects growth of 3.5 percent in 2012, unchanged from its last forecast on April 17. Since the IMF’s April outlook, yields on 10-year Treasury bonds have fallen to 1.4 percent from 2 percent, German 10-year government bond yields have dropped to 1.2 percent from above 1.7 percent, and the Shanghai Stock Exchange Composite Index of Chinese stocks has fallen 8 percent.